The following quotes all come from a promotional piece I received pushing an upcoming conference at Ginghamsburg Church in Ohio. 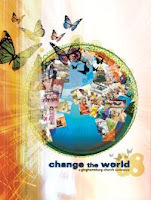 The Change the World Conference is in October and looks like something worthwhile. While it is too early for me to make a commitment to go, I loved some of the quotes by some of the featured speakers and leaders and thought you may also enjoy them. Though some may be a bit controversial, they will provoke some thought and dialogue. The conference is intriguing – some of my favorites are going to be there. The Wallis quote really hit home: if it doesn’t include the poor it’s not the Gospel. Hope that we understand that more as the Church.